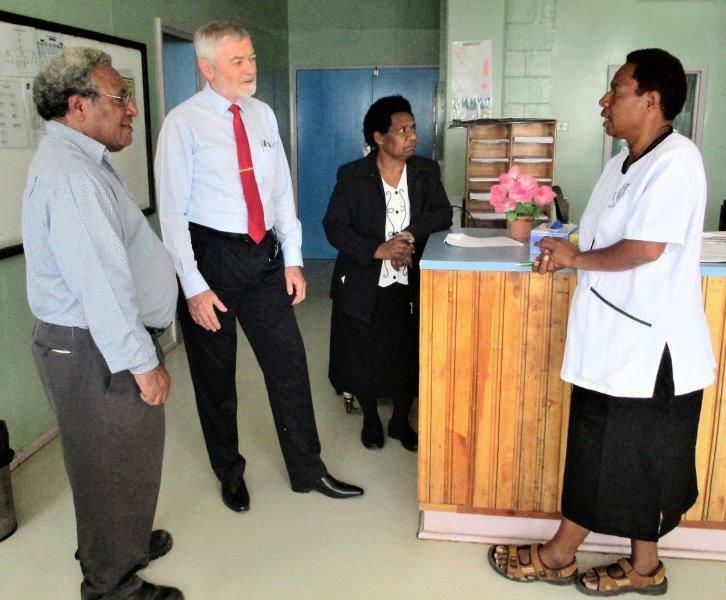 Some employees of Mt Hagen Hospital were caught off-guard recently when the Chairman of the Western Highlands Provincial Health Authority Board, Mr David Guinn made a surprise visit on them. Mr Guinn was at the hospital to attend a Board meeting on 3rd July 2018 when he decided to use the opportunity to visit and chat with clinical staff in some of the wards. The visit gave him an opportunity to learn about work-related issues affecting staff in the respective wards and what the Board and Management could do to address them. Acting Director for Curative Health Services, Dr Paulus Ripa and Director of Nursing, Sr. Roselyn Kali accompanied the Chairman on the visit which took them to the medical, surgical, children’s and labour wards and the intensive care unit. Mr Guinn was also given a tour of the newly-refurbished Emergency Department which includes the Accidents and Emergency (A&E) and the Adult Out-patients Department (AOPD). Work is still continuing in the AOPD and is expected to be completed within the next week. The A&E has been completed and patients are currently being treated and either discharged or admitted to wards depending on the seriousness of their injuries or illnesses. The Emergency Department has been renovated at a huge cost and will be officially opened in late August to show the public the importance the Western Highlands Provincial Health Authority places on patient care. Emergency Physician, Dr John Junior McKup (right) makes a point during the Chairman’s visit to the Emergency Department. 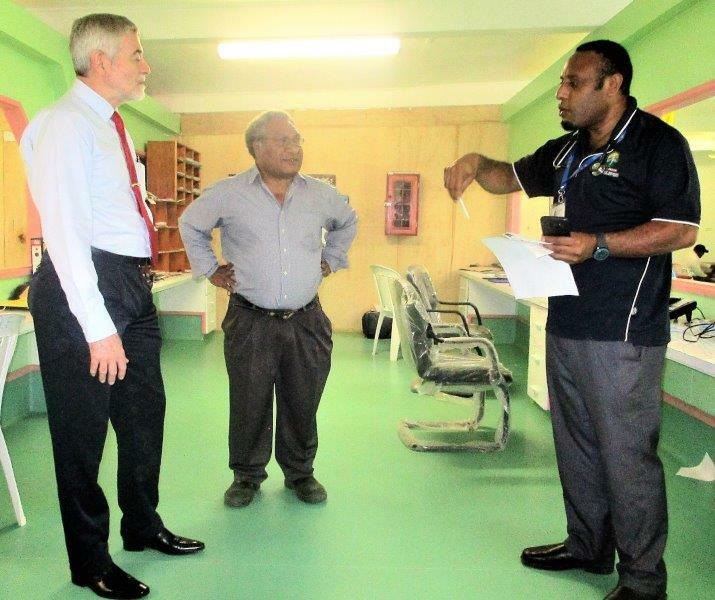 Deputy Manager of ICU, Sr. Kel Ronom (right) briefs Chairman Guinn and Dr Ripa and Sr Kali on the operations of the ICU. 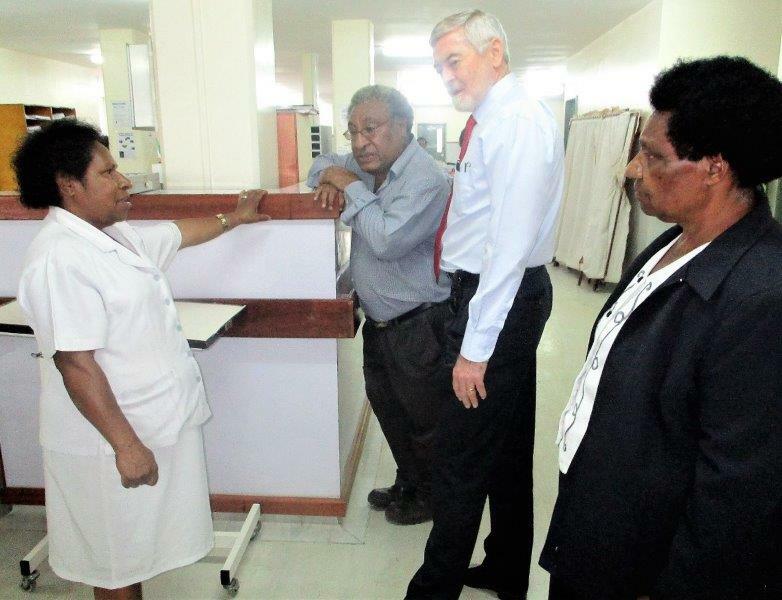 Chairman Guinn, Dr Ripa and Sr Kali are being briefed on the operations of the surgical ward by Ward Manager, Sr Elizabeth Malt.